I’ll confess right here that I feel a little embarrassed following a Christian Young Adult fantasy series starring a girl character. But the Rachel Griffin series is delightful, rewarding, and uplifting. The Awful Truth About Forgetting is just as good as its predecessors. In this episode, Rachel returns to the Roanoke Academy of the Sorcerous Arts after a visit home, following the traumatic battle that ended Rachel and the Many-Splendored Dreamland. Rachel, as you know if you’ve been following along, lives in an alternate world where magic is real and neither Judaism or Christianity has ever been heard of. She is one of the “Wise” – those who see and understand magical things, as opposed to the “Unwary” – ordinary folks who know nothing of Rachel’s world. In other words, Muggles. Rachel is the daughter of an English duke who is also a top law enforcement agent in magical matters. Rachel has an eidetic memory – she remembers everything, which makes learning easy. But she’s in an odd situation now, since false memories were implanted in her mind after her recent traumas (for her own protection). This means she has a double set of memories. 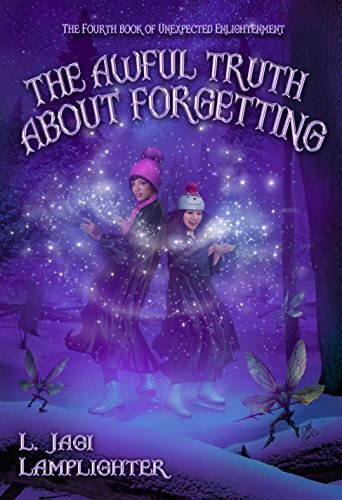 She can fool the people who gave her the false memories by pretending those are all she has, but then her friends – who do remember what she’s supposed to have forgotten – would know something was wrong, and they might get drawn into the whole mess. But she has the help of a very powerful supernatural protector, which also comes in handy when the school comes under magical attack. There’s also a lot of typical school story material here, about who’s best friends with whom, and how different friendships are ranked against each other. And boyfriend stuff, and a new attraction. But what I love about the Rachel Griffin books is that there are Narnia moments. Not only moments of homage to those books (“Jack” even gets a mention), but scenes that evoke the feelings I get from Narnia stories. That’s what really makes this series shine. Recommended for teens and up – except that there’s a lot of magic and wizardry and mythological stuff which some Christian families will find unacceptable.